Trump Files Documents To Shift Management Of Businesses To His Sons : The Two-Way For many weeks, the president said he would step away from managing his businesses, but he offered no evidence. Now documents are turning up, showing he no longer is listed as top executive. Police stand guard outside the Trump International Hotel in Washington the day before the inauguration. The president's business interest in a government-owned property has drawn criticism from Democrats and some ethics advisers. President Trump is now filing the documents needed to remove his name as top executive at his companies, finally making good on a promise to leave management by Inauguration Day. He may be a couple of days late, but public documents show Trump is making changes at the helm of his businesses. For example, a filing from Florida's Department of State, entered Monday, shows son Eric Trump as president of Trump International Hotels Management LLC. In March 2016, Donald J. Trump had been registered as president of the company. That sort of management shift was confirmed in numerous documents that began appearing online throughout Monday afternoon. The filings don't show a change in ownership, just a replacement of Donald Trump as the top executive. The Trump Organization may have gotten a nudge from a weekend report by ProPublica, an independent nonprofit news service. It had contacted officials in Florida, Delaware and New York and found no indication that Trump had begun transferring management to his sons. White House spokesman Sean Spicer was questioned Monday about whether Trump would release documents verifying the president had resigned from his businesses. Spicer said Trump has "resigned from the company as he said he would before he took office," adding "he's taken extraordinary steps to ensure that that's happened." It's believed Trump has more than 500 business entities, so re-registering them all could take some time. He did manage to sever ties with his businesses in the United Kingdom in time for his inauguration Friday. Meanwhile, one of Trump's newest ventures — the Trump International Hotel in Washington, D.C. — had a rough first couple of months. The luxury hotel just blocks from the White House may have been sold out for inauguration festivities last week, but it lost more than $1.1 million in its first two months of operation. The hotel lost $334,000 in September and $825,000 in October. The Trump Organization had estimated a $84,000 loss in September and $481,000 profit in October. Those figures come from the federal General Services Administration, which owns the historic building that houses the hotel. GSA information was obtained by Democrats on the House Oversight Committee. Reps. Elijah Cummings, Gerald Connolly, Peter DeFazio and Andre Carson asked the GSA for any correspondence it has had with the Trump Organization. They want to see how the federal agency is addressing an "apparent breach" of the hotel's lease agreement. When the Democrats got the GSA information, they released it to the public on Monday. The lease explicitly says "no elected official of the government of the United States" may hold that lease. The letter said the documents did not give any reason why the hotel's income levels for its first two months were so far below the company's own projections, although September was a soft launch for the five-star hotel. There were no figures from November, when Trump won the presidential election, until now. One of the concerns ethics analysts have is that the hotel could create a conflict between Trump's business and his presidency. 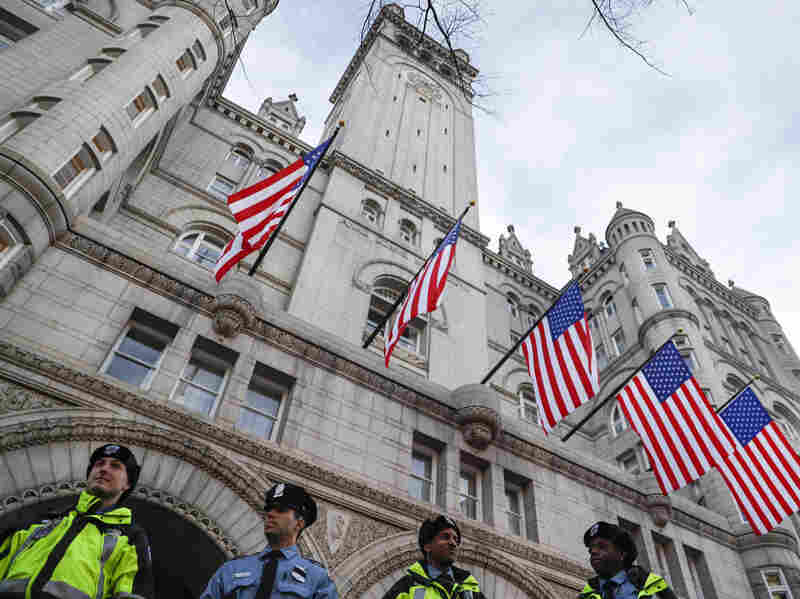 For example, foreign governments, lobbyists and special interest groups may stay at the hotel, just blocks from the White House, as a way of currying favor with the president. Trump's lawyers say he will hand over any of the hotel's profits to the U.S. Treasury Department. NPR intern Lucia Maffei contributed to this report.